Are you looking for a holistic dentist who removes wisdom teeth in Burtonsville near Silver Spring, Clarksville or Columbia Maryland? Dr. Gary Adams is one of the best dental surgeons for holistic wisdom teeth removal in the DC and Maryland areas. People travel from all over the DC metro, US and abroad. Two things that separate our holistic oral surgery practice are 1) use of safe IV sedation options 2) Dr. Adams holistic and natural approach to wisdom teeth surgery. Dr. Adams’ biological approach uses platelet rich fibrin (PRF), ozone-oxygen therapy to reduce pain, swelling and recovery time after extractions. Remove any soft tissue growing in the extraction site. This cyst tissue is typically full of bacteria and fungus. Ozone and Oxygen gas placed into the extraction site. The gas kills bacteria in the pores of the bone and promotes healing. Place 1 or 2 stitches to keep gum tissue stable and hold the clot and PRF. Dr. Adams has removed thousands of wisdom teeth. If you have dental anxiety, Dr Adams offers different dental anesthesia options. We will not judge you for being nervous. We offer complimentary consultations. Contact us if you want to meet Dr. Adams and find out how much it costs to get put to sleep and have impacted wisdom teeth taken out. Best Technique for Wisdom Teeth Removal? It’s best to to remove teeth as carefully as possible without using much force and without causing unnecessary trauma. (sedation dentistry is a good idea if you have dental anxiety) For example, what you would not want to do is pull as hard as possible to get the tooth out quickly. A better approach is to separate a multi-rooted tooth into pieces and take it out one root at a time. This approach to tooth extraction is often called “atraumatic tooth extraction” procedure. When a tooth is taken out carefully with less force, it results in less swelling and pain, faster wisdom tooth healing period. We use some of the most careful oral surgery techniques available for tooth removal. Additionally, we have treatments such as PRF and ozone dental therapy that helps speed up wisdom teeth surgery healing times. PRF is a treatment that helps oral surgery procedures recover faster and decreases the risk of extraction socket infection. 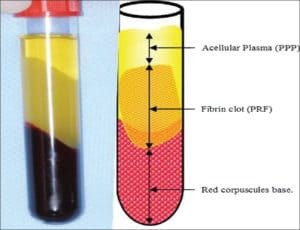 PRF is made by drawing a small amount of patient blood and spinning it in a centrifuge for 13 minutes at 2700 RPM. The Spinning process will separate out the yellow PRF layer of interest. PRF consists of fibrin, white blood cells and bone growth factors. The primary growth factor is bone morphogenic protein. PRF looks like a yellow jello-like substance that can be put into extraction sites and dental implant surgery site. Dental ozone and oxygen gas is placed into extraction sites to promote healing of gum and jaw bones. Ozone also kills bacteria, fungus and other pathogens and toxins hiding in the pores of bone cells. Bone does not have a lot of blood supply and is particularly susceptible to infection and healing delays. Ozone is especially helpful in preventing dry sockets. Once a tooth is extracted, it is very important to remove the PDL or the periodontal ligament and any irregular granular tissue / scar tissue. Once the extraction socket is cleaned then the ozone should be used in the extraction socket. This completes the extraction and cleansing of bony socket. The final step in natural holistic extraction technique is to place PRF into the extraction socket. How to remove a two rooted wisdom tooth and preserve bone and the extraction socket. Basically, the roots are separated into two pieces and removed one root at a time. This technique can be done without the need to apply much force. Wisdom teeth removal cost is $300 – $750 each depending on the position in the jaw and what is covering it. Dental Insurance will often cover up to 80% of surgical costs. Dental anesthesia and sedation procedures are an option but add to the cost of wisdom teeth removal procedures. Do I need to get put to sleep? No, but It would not be a bad idea. It is only necessary to keep you calm and comfortable during the procedure. Sleep sedation will help you remain calm and comfortable throughout the procedure while your body can preserve it’s energy for healing and recovery. People who have sedation report less dental anxiety during the procedure and for future dental appointments. 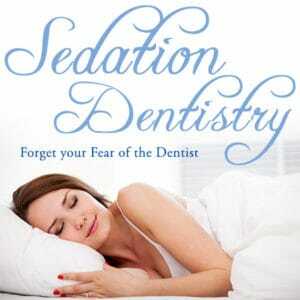 Sedation dentistry usually results in less pain and swelling and complications after the procedure. Full Sedation requires having someone drive you to and from your dental appointment and you will not be able to drive or work for 24 hours. 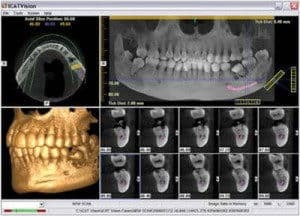 Do I need a 3D Cone Beam / CT Scan? Yes. For oral surgery services we need to identify where the wisdom teeth are and vital structures such as nerves and arteries in your jaw to avoid aggressive surgical incisions and unnecessary trauma or permanent damage during the procedure. It is always best to remove impacted wisdom teeth, but… sometimes removing impacted wisdom teeth can do more harm than good. For example, if a horizontal wisdom tooth impaction is removed and the patient experiences permanent jaw nerve damage, hindsight may suggest the tooth may have caused less harm had been left alone. 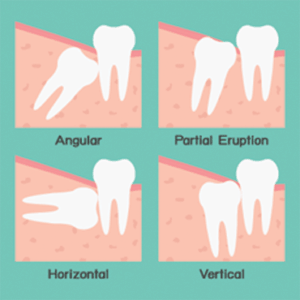 Removing wisdom teeth may be a matter of whether or not there is infection present or whether or not the impacted wisdom tooth is harming the root of the molar in front of it. It is best to get a consult from an oral surgeon or another dentist with a oral surgery experience.Do I need to remove wisdom teeth? Maybe. If they are too far back to clean or if there is not enough room in the mouth for them to grow into the mouth, than Yes. If you do not take them out, one day your jaw will swell and you will be forced to drop everything you are doing. Wisdom Teeth are too far back to properly clean. In fact cleaning wisdom teeth in many cases is impossible. Wisdom teeth can cause dental cavities, periodontal or gum disease. 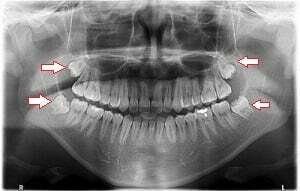 Wisdom Teeth can have cysts form around them and severely damage the jaw bone. Wisdom Teeth also can interfere with proper closure of the upper and lower jaws. Wisdom teeth can cause a poor bite and can lead to TMJ pain. By retaining WT, most individuals will get dental cavities or dental caries, periodontal or gum disease and TMJ problems. Many people can have severe damage to their second molars which are the teeth in front of the Wisdom Teeth. Often WT can come in sideways. When the teeth come in sideways which is also called horizontally impacted, the can cause severe dental decay on the second molars. Sometimes the damage to a second molar can be so severe, the patient will lose both their Wisdom Teeth and 2nd molars. Most of the time removal is a matter of health and preventative dental care. Usually some pain for 1-2 days (relieved by ibuprofen and pain meds) followed by soreness for a week or so.